Food Review: Thai Flavor | Food and Drink | Style Weekly - Richmond, VA local news, arts, and events. Lad na, a rice noodle dish with broccoli and brown gravy, is an example of the fresh appeal of Thai Flavor in Innsbrook. For no apparent reason, some restaurants are extraordinarily busy. These places — and who can fault them? — serve dumbed-down food that they pump out in quantity. The result: Sushi is bland, steakhouses are predictable and Mexican joints run speedy lunch specials. The masses order rice or refried beans and head back to their offices to finish the workday. Sadly, it almost comes as a surprise when a restaurant is more than the sum of its strip mall. But as with anything, the real contenders separate from the pretenders. Thai Flavor looks average. There's no ambiance and no flash; nothing distinguishes its space. Tables and chairs are neither uncomfortable nor comfortable. Laminated food insta pics line an open kitchen, which shows every practiced move. But behind this unremarkable Innsbrook setting is a Thai family bringing the heat, literally. The pad Thai ($7.95-$11.95) is among the best I've had in a great while. Sugar plays well with chili pepper, and sticky rice noodles mesh with scrambled egg and tamarind; this rendition of an overhyped dish deserves some glory. It's clear this is the most popular dish in the repertoire. One day, it's revelatory, the next (while still charmingly edible) it seems mass-produced. Lad na, a wide-rice-noodle dish, is served with tender broccoli stems and a full-flavored brown gravy. It's hearty in portion and easy on a beginner's palate. Spicy fried rice, kao pad basil ($8.95), is the fullback of Thai Flavor's menu. It does all the work a chili-laced dish should, but usually without acknowledgement. Rice is covered with smoky spices that add a fiery component to pungent fish sauce with highlights of sweet basil. 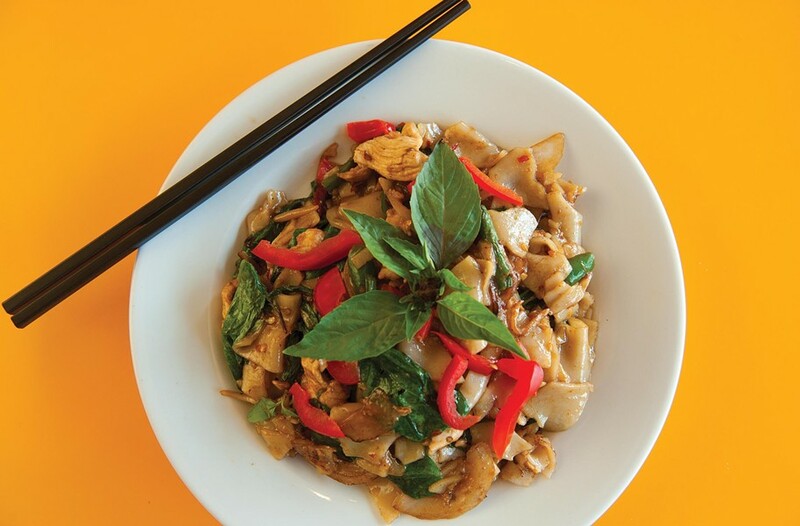 Pad kapow ($8.95-$12.95) also makes great use of basil. Sometimes referred to as the holy basil stir-fry, it is a simple dish that lets the ingredients shine. For those looking for fewer calories but the same bang, larb ($6.95) a tangy meat salad teems with red onions. Missing are the toasted rice and a little more cilantro that would brighten the dish and give it more snap. Must-samples are the noodle soups. Served only at dinner, they're time-consuming layers of flavor. Duck-noodle, called guay thew ped ($8.95), is luscious with wide, soft noodles in a brown broth. Tom kha gai ($6.95) is lighter than expected, a flavorful chicken soup made with coconut broth. Galangal, a type of ginger, chilies, lemon grass and lime leaves are artfully placed to add color and heat. Because Thai Flavor is so busy, service can be hit or miss. On a couple of occasions, our server seems to never leave our table. Our water glasses stay full and extra sauces are delivered with explanations on how to pair different components. On other visits, service is lackluster with appetizer plates lingering and empty glasses unnoticed. Tuesday-Friday 11 a.m.-3:30 p.m. and 4:30-9:30 p.m.